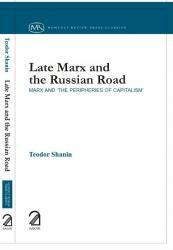 Late Marx and the Russian Road addresses in a new way Marx’s attitudes to societies we describe today as ‘developing’ or ‘peripheral’ and to social and socialist theories which originated in them and which reflect their particularities. It argues that the intensive research coupled with public silence during the last decade of Marx’s life represented a new, theoretical, ‘post-Capital’ threshold. This phase corresponded—not accidentally—with intensive studies of Russia and contacts with its theorists and revolutionaries. Russia was the first ‘developing society’ in the sense accepted today, and its social and intellectual context were to produce by the turn of the century the first wave of ‘modernization’ theories and strategies, as well as Leninism. Included in this work are the translations of Marx’s notes from the late 1880s, hailed as one of the most important ‘finds’ of the last century. Teodor Shanin,a sociologist, taught for many years at Manchester University.